Today’s is a high paced world where people want to maximize the use of technology and hitech services to save more and more of their time which they can devote in other pleasure activities. That’s why people have now started to prefer buying things and services online from e-commerce websites or through mobile apps selling the relevant products. These websites or apps after taking an order, deliver the concerned things to the customer’s doorstep. With the exponential growth of Internet and smartphone usage in past few years, this trend is becoming even more prevalent. Uber is one such company which has changed the entire landscape of the service industry similar to the e-commerce which did the same for selling products. Uber like model has been very successful hence even the service industry is trying to implement it in order to survive and grow. This model is called the On Demand Delivery model and the mobile apps which promote this are called On Demand Delivery apps. So many businesses and merchants are looking for perfect mobile app creator which can deliver an amazing and feature rich On Demand Grocery Delivery app for their business. So many apps have already became extremely popular in the app world. The On Demand Delivery Apps connect the consumers and the service providers in a new way which is a win-win situation for all the people involved. All On Demand Service Delivery Apps are based on two things: What to serve and where? Using these two parameters, all the customers are served and the business takes off rapidly. That’s why On Demand Delivery apps industry is growing at a fast rate. Uber, GrubHub, BigBasket, InstaCart, Zomato, Google Fresh and Amazon Prime Now are examples of the apps which are working based on this new model. For example, when an Uber user orders a cab on Uber app, the cab reaches him and takes him to his chosen destination. Similarly, when a BigBasket user orders a grocery item, it reaches his doorstep. Business are particularly interested in iOS App Creator to build their app as the userbase for iPhones is more affluent and iPhone users tend to use these On Demand Delivery apps more than the Android users. Why the On-Demand Grocery Delivery App Becoming More Famous? Following are the main reasons why people are preferring more and more the On Demand Grocery Delivery apps and why they are becoming more and more famous day by day. Convenience: On Demand Grocery Delivery apps offer lots of convenience to the users as they don’t need to go anywhere physically to buy things and the things are delivered right at their doorsteps. They just need to open the app from their mobile phones, choose the products, check out and that’s it. Hence convenience is the main reason why On Demand Grocery Delivery apps are becoming more popular. Saves Lots of Their Time : If you have to go for grocery shopping, then it needs many hours of your busy daytime. You even have to spend hours on the road in huge traffic other than that the time is required for selecting things at the store, check out and come back to your car also. This means you need atleast 2-3 hours of your time. 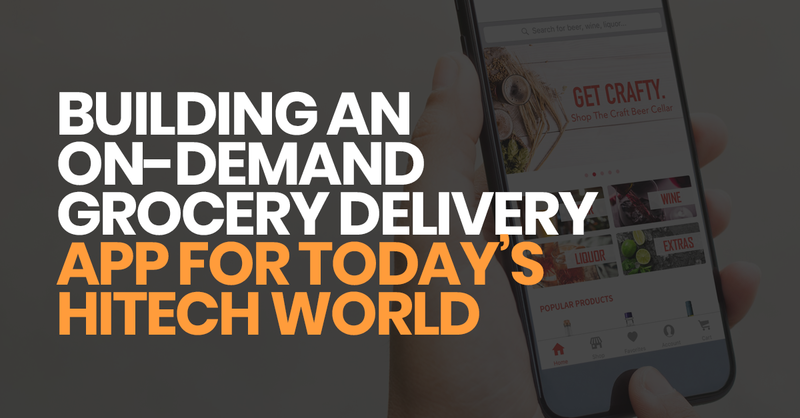 While shopping with an On Demand Grocery Deliver apps will need only 5-10 minutes of an experienced user’s time and about 20-30 minutes of a new user. You can see the difference yourself and know which can save more of your time. Saves Money : On Demand Grocery Delivery Apps also save lots of money of their customers. For example, the traveling expenses are not required. Also as there are no middlemen hence the app owner and online store owners generally provide huge amount of discounts to their customers hence they can save big by buying their grocery online from the On Demand Grocery Delivery Apps. Looking at the above benefits you can understand easily why businesses are looking for iOS Development Company or Android development company to build their On Demand Grocery Delivery app. Majority of the On Demand Grocery Delivery Apps make a channel between sellers, buyers and drivers hence the main app is divided into 3 main parts i.e. for Sellers, Buyers and Drivers. Hence you should include the below given features in these parts to build a truly amazing On Demand Grocery Delivery App. Payment Options – NetBanking, Card etc. We have just discussed what are the On Demand Grocery Delivery apps, why they are becoming extremely popular and what are the required features of these apps which the app developer should include while building the apps. Also as an owner of the app you have to decide whether you will Hire iOS App Developers or Android app developers to build your app means you can launch your app on one platform atleast initially and later on you can even have your app built for both the platforms to reach larger user base. Hence you should contact an expert mobile app developer to build your On Demand Grocery Delivery app and take your business to new heights by beating your competition by huge margins.